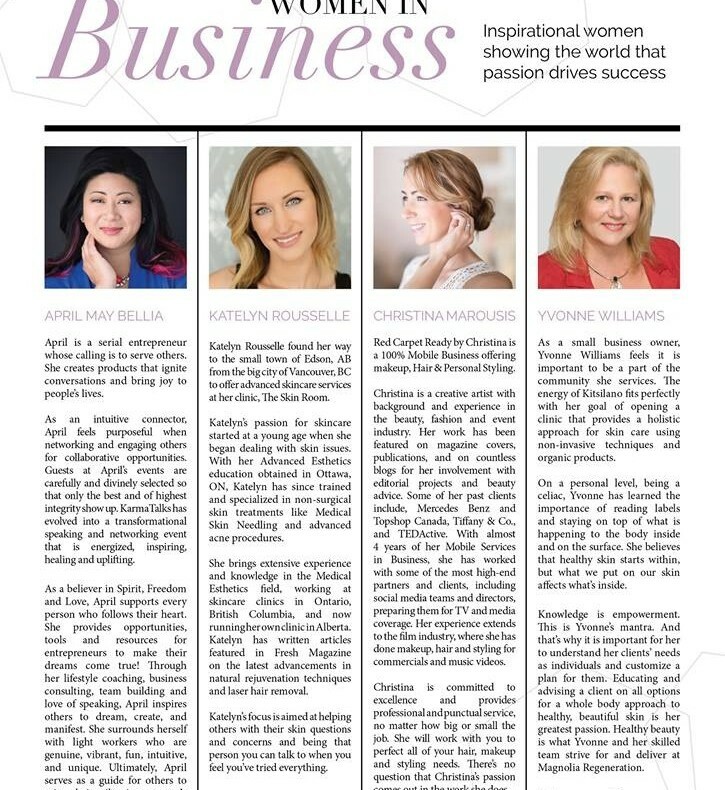 On stands this month, I am honoured to be featured in Fresh Magazine‘s ‘Women in Business‘ Section. Vancouver is full of amazing women out there doing what they love, making a difference, working hard, juggling work and family…and to be associated with this kind of Magazine in this way…is something I’ve very proud of. To the 3 other women on this page, I give a shout out to you and wish you and your businesses much success in the future. To the Editor Shelly Lynn Nellis, whom also is a mother, and a very busy woman…I thank you for this opportunity. Your Magazine is full of health, beauty, Fashion, Style and inspiring Women! It’s amazing to have a platform like this, to communicate and connect. I love to meet new people and collaborate with other professionals…and to boot Pamela Anderson is on the cover, looking so beautiful and she’s a BC girl! I look forward to many more opportunities to come in the future! There is no cap on what you can do when you work for yourself…there is no boss to ask permission to do something…there is only you. When you set your sights on something…and you want it, you are driven by an authentic feeling that doesn’t go away…it drives you and keeps that fire inside, lit.